Not to be confused with the Nordic Model. Pan-Scandinavianism as a modern movement originated in the 19th century. The Pan-Scandinavian movement paralleled the unification movements of Germany and Italy. As opposed to the German and Italian counterparts, the Scandinavian state-building project was not successful and is no longer pursued. It was at its height in the mid-19th century and supported the idea of Scandinavian unity. It was spurred on by philological and archaeological discoveries of the 18th century and 19th centuries, the rise of Pan-Germanism (and Pan-Slavism) and a general fear of Russian expansionism. The movement was initiated by Danish and Swedish university students in the 1840s, with a base in Scania. In the beginning, the political establishments in the two countries, including the absolute monarch Christian VIII and Charles XIV with his "one man government", were suspicious of the movement. The movement was a significant force from 1846 to 1864, however the movement eventually dwindled and only had strong support among the Swedish-speaking population of Finland. The collapse of Pan-Scandinavianism came in 1864 when the Second Schleswig-Holstein War broke out. King Charles XV who was the King of Sweden-Norway from 1859 until his death in 1872, in spite of championing Pan-Scandinivianism failed to help Denmark in the war. Author Hans Christian Andersen became an adherent of Scandinavism after a visit to Sweden in 1837, and committed himself to writing a poem that would convey the relatedness of Swedes, Danes and Norwegians. It was in July 1839, during a visit to the island of Funen in Denmark, that Andersen first wrote the text of his poem, Jeg er en Skandinav ("I am a Scandinavian"). Andersen composed the poem to capture "the beauty of the Nordic spirit, the way the three sister nations have gradually grown together", as part of a Scandinavian national anthem. Composer Otto Lindblad set the poem to music, and the composition was published in January 1840. Its popularity peaked in 1845, after which it was seldom sung. Despite the movement severely dwindling there was a resurgence of Pan-Scandinavian sentiment in the latter part of the 20th century. The Sherlock Holmes story "A Scandal in Bohemia" mentions a fictional King of Scandinavia whose daughter is about to marry the (also fictional) King of Bohemia, a major protagonist in the story. ^ a b c d e "Pan-Scandanavianism". Encyclopedia Britannica. Archived from the original on 2018-02-07. ^ a b "Pan-Scandinavianism" Archived 2007-09-29 at the Wayback Machine. (2007). In Encyclopædia Britannica. Retrieved April 29, 2007, from Encyclopædia Britannica Online. ^ a b Ola Tunander (1999). "Nordic cooperation", UDA085ENG. In Nytt fra Norge, ODIN – Information from the government and the ministries, Ministry of Foreign Affairs, Norway. See also Tunander, Ola (1999). 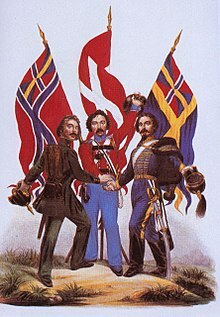 "Norway, Sweden and Nordic cooperation". In The European North – Hard, soft and civic security. Eds. Lassi Heininen and Gunnar Lassinantti. The Olof Palme International Center/Arctic Centre, University of Lapland, 1999. pp. 39–48. ISBN 951-634-690-1. ^ J. P. T Bury. "The New Cambridge Modern History: Volume 10". Archived from the original on 2018-04-14. ^ "Charles XV". Encyclopedia Britannica. Archived from the original on 2017-10-12. ^ "About Pan-Scandinavianism. Reference Points in the 19th Century (1815-1864)". academia.edu. Archived from the original on 2016-03-17. ^ a b c d "I am a Scandinavian". Hans Christian Andersen and Music. Archived from the original on 2009-01-13. Retrieved 2007-01-12. Hilson, Mary. "Denmark, Norway, and Sweden: Pan-Scandinavianism and Nationalism". University of Portsmouth. Archived from the original on 2018-04-14. The Helsinki Treaty of 1962 Nicknamed as constitution of the Nordic Countries.